February is a great time to shop for new gear for spring fishing and the spring turkey season as major outfitters and department stores offer clearance and closeout sales. It is an especially beneficial time to upgrade fishing gear. Although the price of a gallon of gas is lower than at any time in recent memory, not many folks have extra money to burn. This is especially true for non-essential things such as fishing reels, shotguns, hunting clothing or fishing waders. Adult commitments, such as your mortgage, must be paid before any money goes toward a new spinning reel. Obtaining quality hunting and fishing gear inexpensively is a useful skill for outdoors enthusiasts to learn. Here are five ways to save money on gear for the upcoming spring fishing and turkey hunting seasons. 1. Hit the clearance sales to upgrade fishing equipment: February is the best month to buy new fishing equipment, especially if you want to upgrade to a higher quality rod, reel or finally retire the shop worn waders you’ve patched 10 times. Manufacturers debut their new models at this time of year. The large catalog outfitters and the sporting goods section of department stores often offer significant discounts on older models of rods and reels to clear space for the new. This is especially true with fishing reels. These discounted reels or rods are still new and were the cutting edge a year or two ago. Model changes are often cosmetic and the performance afield is exactly the same from older model to new. If you are still wading with hot, sticky and leaky neoprene or coated canvas waders, February is the time to upgrade to breathable waders. New fishing catalogs from outfitters are now arriving in mailboxes around the country. Their websites often contain closeout prices on older iterations of breathable fishing waders. This is a great time to get comfortable, breathable waders at attractive prices. 2. Hit the clearance sales to upgrade hunting clothing: After the waterfowl seasons close in late January, department stores and the big retail/catalog outfitters often place cold weather hunting gear on clearance, where savings can be 40 percent or more off the price the previous fall. This is an especially good time to save on waterfowl hunting clothing or coveralls and jacket/bib combinations for deer hunting, both of which aren’t cheap. They often clearance leftover lighter weight camouflage shirts and pants as well, perfect gear for the coming spring turkey season. 3. Inquire with friends and relatives about buying their old outdoor gear: As you progress in the outdoor arts, it is normal to upgrade to newer gear every few years as financial circumstances allow. This leaves outdoors enthusiasts with a conundrum: their older gear is too nice to throw away or donate, but they don’t use it anymore. They may gladly sell this gear reasonably to a friend or relative and be thankful it will be used and appreciated by someone they know. In the case of outdoor clothing, it may be given to you. 4. 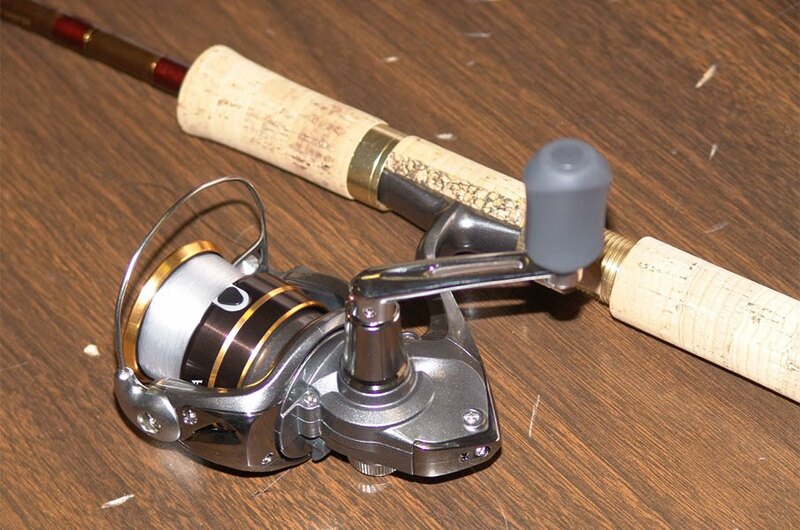 Clean and lube a spinning reel to make it new again: If a spinning reel feels like it is slowly filling with sawdust or develops an annoying catch on the retrieve, it is likely not completely shot and needs replacing, but just dirty and starved for lubrication. Old grease and oil attracts dirt and grit over time. This gunk builds up and impacts the reel’s performance. Remove the reel spool and wipe down the spool shaft and apply a light coat of reel oil. Oil the roller bearing on the bail that lays line on the spool. Remove the handle and the screws that hold the side plate (some reels have a decorative plate that covers one of the side plate screws). Gently pry open the side plate. You’ll see the main gear in the middle with a roller bearing on top of it. Remove the roller bearing and drop it in rubbing alcohol to dissolve old oil, grease and accumulated crud. Clean the main gear, the drive gear in front of the reel and the worm gear along the bottom with an old tooth brush and hot soapy water. After drying, apply a light coat of reel grease to the gears and apply a few drops of reel oil to the roller bearing. Reassemble the reel and it should sing like new. 5. Buy a used pump shotgun for spring turkey hunting: A turkey hunting shotgun is a utility gun, not a pretty over-and-under for wing or trap shooting. Gun stores often have used pump shotguns for $150 or less. A friend or relative who’s hunted for years often has an old pump they would let go of at little cost. Online auction sites have used pumps for bargain prices as well. As long as it functions, the appearance matters little since the first step is covering the gun with camouflage tape, making sure not to interfere with its action in the process. At this price, you can afford to add a red or green rear bead sight. Now, you have an affordable and perfectly functional turkey hunting shotgun. A 12-gauge that can chamber 3-inch magnum shells is best. Use these tips to save much needed cash in getting the outdoor gear you need. The warm winds of spring are just around the corner.